Colours. Colours are just the best! But whoa! The pain of finding such picture to draw! I always bump into images of watercolor sets with water and brushes and all that, so I figured I'll just copy one, but when I decided it, I just couldn't find any of those! (and the fact that the word ‘painting’ both means the action and the result did not help much...) Are artists not doing that anymore? 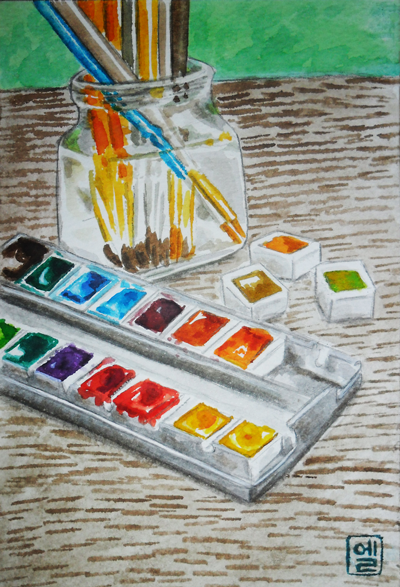 Showing off your fancy-pancy watercolor set near your Work In Progress? Anyway, as always, stealing from Shutterstock saved me… after 6 long hours of pointless searching.